The Grand National weights were announced last night, with recent Cotswold Chase winner Definitly Red top of the pile on 11-10. 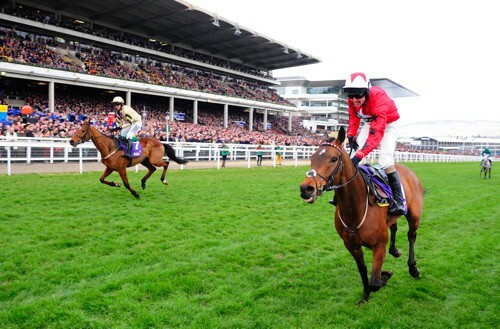 Mightily impressive at Cheltenham last time, he was pulled-up early last year when impeded at Bechers. Though clearly talented, he’s not the biggest, and carting top-weight looks a tall order. Bristol De Mai was allotted a pound less, but trainer Nigel Twiston-Davies said the seven-year-old will not be running. Instead, he is likely to contest the Betway Bowl on the opening day of the Aintree meeting. Gigginstown supremo Michael O’Leary has had plenty to say about the handicapper’s decision-making process and the treatment of his Irish raiders. The team have numerous entries as they look to add to the success of Rule The World in 2016. Outlander tops the Gigginstown contingent on 11-08 but is unlikely to head to Aintree, with Punchestown the preferred option. Sub Lieutenant and Valseur Lido come next, though it’s Tiger Roll at 10-09 and Thunder And Roses at 10-01 that catch the eye. The former heads to Cheltenham for the Cross Country next month having been an impressive winner of the four-miler at Prestbury Park last year. The latter was fourth in the Irish National last April and looks to be fairly treated on that performance. Evan Williams has produced several National contenders in recent times, including Aintree regular State Of Play. Despite being a quirky character, I can’t help being drawn to Buywise who has been allotted 10-04. Down the field behind Rule The World when last tried in 2016, he’s since run a cracker last April at Cheltenham in the Ultima Chase and cruised to victory in a Veterans’ Chase at Sandown. Two-time National winning jockey Leighton Aspell has been aboard on his last two outings. Should the pair hook-up at Aintree, they’d be an interesting each-way proposition at big odds. Others that caught the eye included Abolitionist (10-04), Three Faces West (10-03) and Final Nudge (10-02). The field is sure to alter plenty between now and five-day confirmations on April 9. The final declarations are made at 10am April 12. A maximum field of 40 go to post.